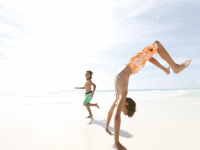 When traveling with children between the ages of 5 and 12, the possibilities for fun are endless. Kids this age want to do and see everything. They are old enough, finally, to enjoy some more mature family-friendly pursuits, like some thrill rides, cultural attractions and water sports. Yet, often they’re just as happy hanging out at the pool all day, every day. 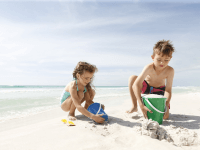 Luckily, Hilton Sandestin Beach Golf Resort & Spa offers just the right combination of comforting and thrilling adventures for kids ages 5 to 12. They will be begging to hit our beach and pools. Make a day of it by reserving a poolside cabana. On the beach, request a set-up so you can lounge on a beach chair beneath an umbrella while the kids flit between the beach and the pools. Register your kids for our popular Kids Krew and Kids Night Out programs. They’ll have fun making friends and engaging in fun, supervised activities. And you’ll reap some well-deserved time off (time off that would be very well spent at our full-service spa). For an extended parental time-out, our Activities Staff can assist you with arranging childcare services. 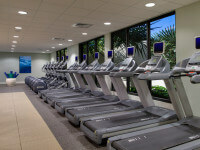 At Hilton Sandestin Beach, mealtime is never a chore. Restaurants throughout the resort offer children’s menus and some even offer discounts for kids 5 to 12. Picnix Poolside Market gets kudos from kids, both for its proximity to our two outdoor pools, and for menu items they know and love, like Pizza Hut™ pizza and create-your-own Arctic Blasts (our combination of ice cream or frozen yogurt with your children’s favorite toppings). Grab a picnic table outside or take your food to go, back to the pool or the beach. Take a family bike ride on our golf cart path. It winds for miles throughout the resort and even tunnels beneath the highway so you can safely explore the bay side of our property. Ask the concierge to arrange bike rentals. Spend a day or evening at the nearby Village of Baytowne Wharf, where you can soar across the Village’s lagoon on a zip line and try a ropes course at Baytowne Adventure Zone. Other Village offerings include Monday night magic shows and Boomin’ Tuesdays, weekly summer festivals offering face-painting, crafts and fireworks. Take a field trip to family-friendly attractions nearby, such as Big Kahuna’s Water and Adventure Park, which promises all the water slides and other watery thrills kids could ask for, and Gulfarium Marine Adventure Park, which hosts daily shows and interactive programs that put kids in touch with marine animals such as stingrays and dolphins. Also, The Track Family Recreation Center lets adventurous kids race go-karts on a three-story spiraling wooden track, among other rides and attractions.